ECIL, a Public Sector Enterprise under Department of Atomic Energy is looking for dynamic and result-oriented persons for the following positions on contract basis for a period of ONE year (which may be extendable further subject to project requirements) to work at Hyderabad against the requirement of Corporate Business Development Group and Corporate Research & Development of ECIL. Scientific Assistant – A first class Diploma in Engineering with at least 60% aggregate marks from any institution recognized by the State Board of Technical Education in Computer Science. The selection process will be through a written test / interview. The written test/ Interview will be held at HYDERABAD only. 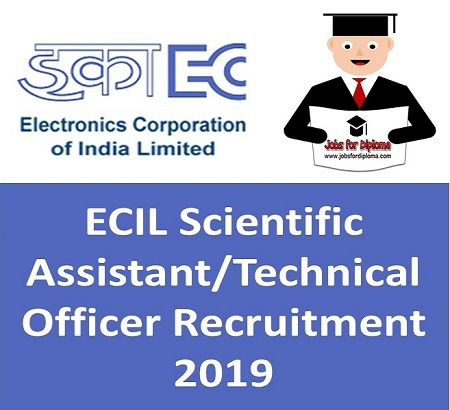 Eligible candidates have to apply ‘ONLINE’ through website “http://careers.ecil.co.in”for getting connected to advertisement details and online application or alternatively apply through our website:“www.ecil.co.in”by selecting ‘Careers’ followed by ‘e-Recruitment’. The on-line application process will be operational from 01.04.2019 (1400 hrs.) to 10.04.2019 (1600 hrs.). Written Test / Interview Details will be hosted on company website as and when decided.